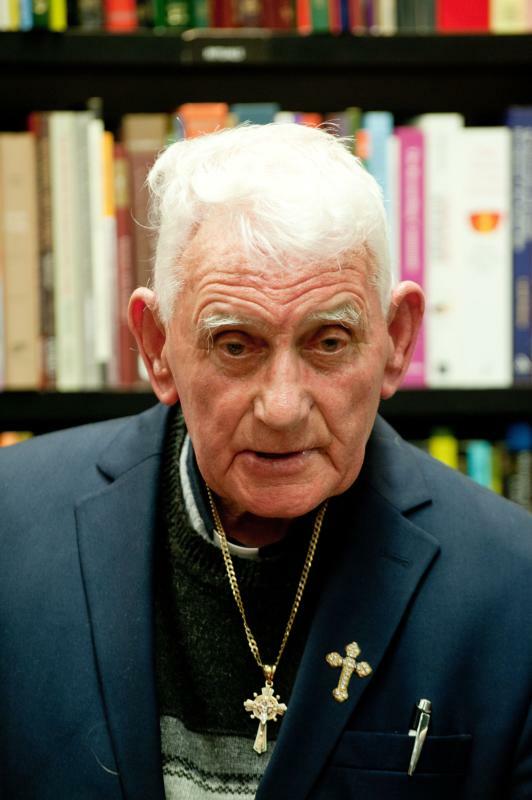 VATICAN CITY (CNS) — The story of how an Albanian priest endured decades of imprisonment, torture and forced labor during his country’s communist crackdown against the church brought Pope Francis to tears. During the pope’s 2014 visit to Tirana, Cardinal-designate Ernest Simoni moved many listeners when he described the brutality a militant atheist regime wielded against people of every faith, and paid tribute to God’s infinite goodness, grace and love for allowing him to survive. Dedicating his life to drawing people away from hatred and revenge, the octogenarian priest will be one of 17 prelates elevated to cardinal in a consistory Nov. 19 at the Vatican. Of the group, 13 are eligible to elect Pope Francis’ successor in a conclave. Cardinal-designate Simoni is one of four who are older than 80 and, therefore, ineligible to vote. Cardinal-designate Simoni, whose 88th birthday is Oct. 18, told Vatican Radio he heard the news of his elevation while watching television as the pope prayed the Angelus Oct. 9. When he heard the pope say his name at the end of the Angelus, he said, “it was a huge surprise for me. I never would have thought” such a thing would happen. “I have to thank the Lord for the life he gave me and for the graces, the many graces I have had,” he told the radio Oct. 10. It is through Jesus, he said, that he, “a poor missionary, a little missionary of Jesus,” prays every day that God’s love would penetrate the hearts of all people. Born to a Catholic family in Troshani, Albania, Oct. 18, 1928, the cardinal-designate went to a Franciscan-run minor seminary and novitiate until it was shut down after the Stalinist dictator Enver Hoxha came to power in 1944 and sought to cleanse the country of all religion. The military drafted the young man in an effort to “make me disappear. I spent two years there, years that were worse than any prison,” he has said. Despite the risks, he studied theology underground and was ordained a priest in 1956, on the feast of Divine Mercy. But the worst was yet to come as the regime, which was set to become the first officially atheist nation in the world, intensified its war against religion in the 1960s. On Christmas Eve 1963, the priest was arrested while celebrating Mass and was sentenced to death by firing squad. He was beaten, placed for three months in solitary confinement under inhumane conditions, then tortured because he refused to denounce the church. All the time he was imprisoned, he has said, he celebrated Mass from memory in Latin, heard confessions and distributed Communion to other prisoners — all clandestinely. Albania had fewer than 200 priests and almost all of them had been jailed; scores of priests were killed. Countless laypeople and religious faced arrest, torture, firing squads, concentration camps and forced labor while thousands of places of worship were confiscated and demolished or turned into movie theaters, gyms and meeting halls. When the regime collapsed in 1991, Cardinal-designate Simoni returned to ministry by serving isolated mountain villages, urging Christians caught up in a cycle of revenge to let go of their hatred and embrace God’s love. Pope Francis said learning how severe the religious persecution was what prompted him to make Albania the first country in Europe he visited. During a vespers service in Tirana’s cathedral, the pope listened to Stigmatine Sister Marije Kaleta and Father Simoni talk about holding onto their faith and sharing it with others despite the cost. The pope was so moved by the priest’s testimony that he removed his glasses and the men briefly rested their foreheads against each other; the pope then put his arm around the priest’s neck and held him. Pope Francis called Albania a land of heroes and martyrs and said Father Simoni and Sister Kaleta “performed a service for us: consoling us” by showing that God always provides the strength and hope to confront and overcome the tiniest inconveniences and the worst atrocities. He has said he never felt any animosity toward anyone — not even those who harmed him — because “Jesus’ love is infinite” and he commanded his followers to love and pray for their enemies. “Whoever loves Jesus, enjoys all of his riches” and receives his “burning flame” of love that overflows and spreads to everyone no matter what.